The journey to Sukayu Onsen in Aomori City, Aomori Prefecture is like a trip directly into the painted background of an animated film. The bus meanders through wooded hills that shine in autumn colors. The gentle slopes are littered with flora in crimson, dark green, bronze and gold and it is a sight I just cannot get enough of. 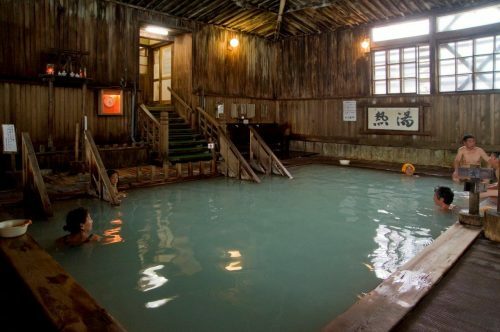 Sukayu Onsen is located on the top of a hill and has more than 300 year history. On the way up the road winds its way through dense forests and often the bus has to slowly drive through the numerous curves because of the narrow road. Often the road leads directly up steep, densely vegetated slopes. The higher we get, the rougher the area becomes. The authentic, wild beauty of Aomori is so easy to fall in love with and the mesmerising landscape easily casts a spell over me and draws me in. However, arriving at Sukayu Onsen I realize that I do not have the best reception with my mobile devices. Which is not a disadvantage for me. Mobile devices have a hard time getting reception up at the Sukayu Onsen. 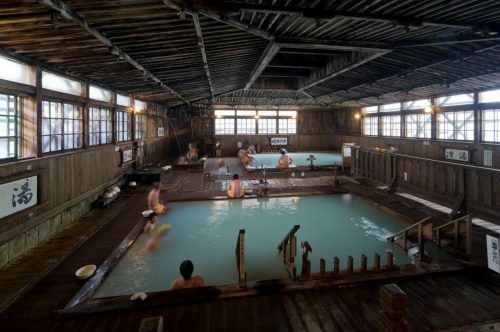 In winter, this onsen welcomes many guests who enjoy winter sports in the nearby Mt. Hakkoda, whereas hikers are frequent visitors during summer. Outside the main season, many farmers come to soak in the hot springs to recover from the rigors of the harvest season and to relax in the regenerating baths. 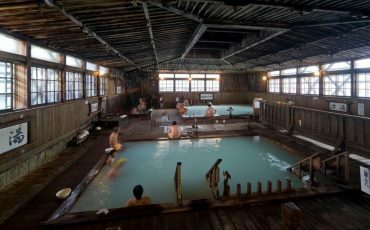 Sukayu Onsen is best known for its large hot spring facility, in which both genders are allowed to bathe together. This bath is called “Senjin-buro”, meaning “1000-person bath”. It is said that 1000 people can bathe there at the same time. However, the actual maximum capacity is 200 guests. 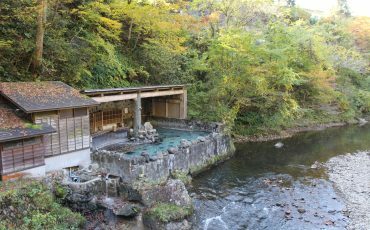 At 248 square meters, the hot spring is exceptionally large. The mixed onsen allows up to 200 guests to bathe together at the same time. As soon as we set foot into the entrance area of Sukayu Onsen, we are welcomed with a home-like atmosphere. Numerous lockers and slippers are provided, and all bathrooms at Sukayu Onsen are supplied with water directly from the hot spring. Therefore, the water has the milky cloudy color and smells slightly of sulfur, as I realise soon. The water is even said to bleach skin brighter. 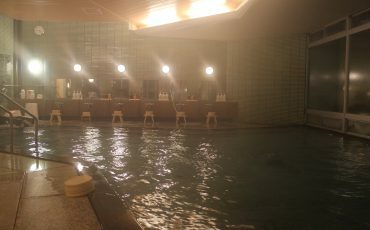 Depending on the hot spring, the temperature is between 39 and 41 degrees C hot. The water in the onsen comes directly from the source. The segregated pools are smaller compared to the large pools in the mixed bath, but here too, we are welcomed with a wonderful, peaceful ambiance to relax in. With the provided shampoo and body soap, I can thoroughly wash myself at the shower heads on one side of the room. Afterwards, I can soak in the splendid hot water and enjoy an extensive bath in the authentic surroundings. Because of the high concentration of minerals in the water, it is recommended to take short breaks every few minutes. Also the mixed baths have a wonderful, relaxed ambiance. 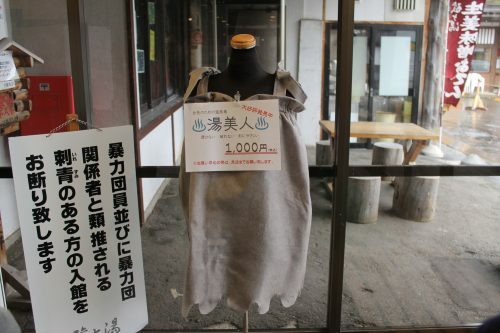 At almost every onsen you have to be completely naked if you want to enter. However, there is a rare exception in the mixed bath at Sukayu Onsen. Women can borrow a short dress, which they are allowed to wear inside the mixed bath. Men, on the other hand, have to be completely naked. 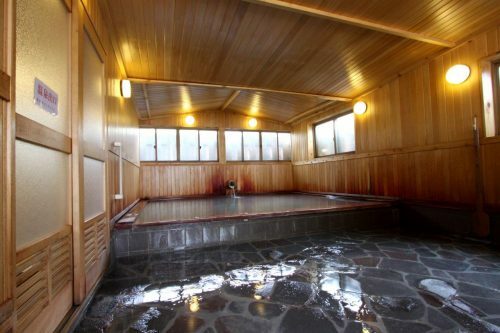 Especially during the cold season, thick, sulfur-smelling steam rises from the pools and gives the wooden hall a nostalgic look. Women may put on these dresses when they want to enter the mixed bath. Guests of the Sukayu Onsen can stay in the adjacent ryokan. The rooms are traditional Japanese styles; the rooms have tatami floors and guests sleep on futon. The rooms are kept simple and have wonderful views of the surrounding nature of Aomori. If you wish to book for a longer period, you can also use a shared kitchen. Again, the water comes directly from the source. From JR Aomori Station and JR Shin-Aomori Station there is the JR Bus Mizuumi-go, which takes you to Sukayu Onsen Mae Bus Station in around 80 minutes. The trip costs around 1400 yen. The mixed bath of Sukayu Onsen is open daily from 7 am to 5:30 pm. The gender-separated bathrooms are open daily from 7 am to 5 pm. Entry to the bath costs 600 yen. 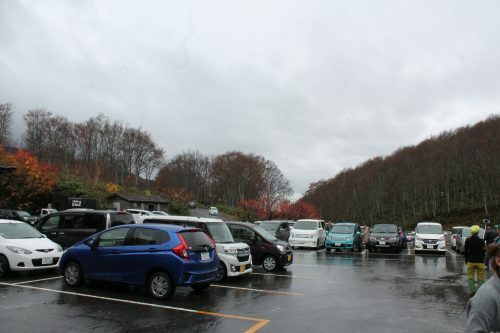 If you want to use the rest of the premises, the entrance costs 1000 yen. For room reservations, please make a booking through here. I am Johanna Christoph. I graduated high school in 2013 and after that I did a seven-month internship at a German regional newspaper. After that, I studied journalism at Kingston University London and graduated in July 2017 with a bachelor's degree. When I returned to Germany I once again worked as a freelancer for eight months at the regional newspaper I once was an intern at. I've been in Tokyo, Japan since March 2018 and I now work as a travel writer for Voyapon.